THE ERIE CANAL was, after all, an artificial waterway. It was, in fact, a ditch 40 feet wide at the top, 28 feet wide at the bottom, and a mere 4 feet deep. Three hundred and fifty miles long, it contained 83 locks 90 feet long, and 15 feet wide including the magnificent flight of twin fives at Lockport, five locks for westbound and five for eastbound traffic, and the flight of 16 to raise boats from the Hudson to the Mohawk at Albany. Until one of the engineers, Canvass White, traveled to England in 1817 and walked 2,000 miles of English canals, no one had seen a completed canal approaching the scale of the Erie. It was White who solved the problem of the hydraulic cement, finding the necessary source near Chittenango and eventually obtaining a patent on the process. 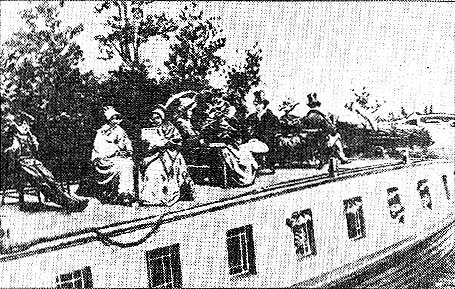 In addition to the building of the locks at Lockport, Western New York faced two other problems. The first was the actual route of the canal. The Canal Commissioners wished to keep the canal below the level of Lake Erie in order to use that head of water and to reduce the amount of digging necessary. The first route surveyed by William Peacock reached a point 75 feet above the Lake, and a second by Valentine Gill reached a 90 foot summit. Later, David Thomas located a more northernly route which kept the canal below the level of the Lake. James Geddes carried the survey from Tonawanda Creek to the Seneca River. The location of this route was important later on when there was sentiment for ending the canal at Rochester. THE SECOND PROBLEM was that of the western terminus of the canal. The two rivals were the chief lake port of Black Rock and the village of Buffalo, at the mouth of Buffalo Creek. James Geddes and Nathan Roberoth favored Black Rock, while William Peacock, David Thomas, and Benjamin Wright favored Buffalo. Both places had obstacles to good port development: Buffalo had a sandbar across the creek, and Black Rock as a river port had the problem of prevailing winds, river current, and winter ice. The citizens of Black Rock felt that Buffalo had an unfair advantage with their newspapers, the Journal and the Patriot; so in December of 1822, there appeared the Black Rock Beacon to argue publicly their case. The battle ceased in 1823 when the engineers who favored Buffalo, with the addition of Canvass White, decided unanimously that Buffalo ought to be the place. The final chapter was written in 1853 when the new city charter of Buffalo incorporated Black Rock. The growth prompted: by the canal had wedded the two villages. The first contracts for digging in the west were granted by Acting Commissioner Colonel William C. Bouck on August 2, 1822. The first actual work, outside of harbor activity, began on August 9, 1823. With the usual first shovel ceremonies, the contractor provided liquid refreshment, and the project was suitably launched. The Buffalo Patriot noted that the record earth-moving day saw 203 cubic yards excavated. WHEN COMPLETED IN I825, at a cost of about seven million dollars, the canal had already proven a success. It had collected nearly a million dollars in tolls on the sections as they were opened to traffic. Surely, an unfinished canal that already paid for one -seventh of its cost was a wise investment, indeed. The impact of the canal was great. It reduced the costs of transportation from $100 a ton to $10 a ton, raised the value of lands along its length, and it helped settle the lands of western New York and Pennsylvania, Ohio and the midwest. It sparked a great canal building fever, especially in the northeast, and produced a great many engineers who would work on other transportation projects in the United States. It added immeasurably to the engineering knowledge available, and helped to tie the mid-west to the northeast rather than to the south along the Mississippi route. It became a continual force in New York politics, added words to the language, stimulated folk tales and songs, provided employment to thousands during and after its construction. It enlarged cities and villages, lead to new ones where there had been merely forest before, and laid down the skeletal outline of New York's urban development and its transportation network. The rude abodes of savage man. You mark'd her steps, but changed her way. ABOUT THE AUTHOR: Dr. Eric Brunger is a professor of history at Buffalo State College and has written extensively an the economic history of New York State. Erie Canal Links on the Erie Canal and on Buffalo's Canal District controversy.